What is escape room game? You can find here the biggest & the best choice of escape rooms in Warsaw. Find out more about our six escape rooms located in two convenient locations: Warsaw Old Town and Warsaw City Center. Choose your adventure and let us take you into another, magical world for 60 minutes! The story behind the escape room doors..
Getting back home through Old Town suddenly you feel like something hard hits your head. You slowly lose your consciousness sinking down on your knees.. With a radiating pain in your head you wake up in a dark, rusty room. Staring around it comes to your mind that you have been kidnapped and locked here. It appears you’re not the only one.. Will you manage to escape? Or maybe you’ll be the next lost victim that they will be writing about in newspapers? 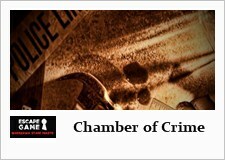 Would you like to know how story behind the locked doors of the Chamber of Crime goes on? We will reveal you a bit of that chapter but the end of the story you’ll experience by yourself. Become and actor and a director of your own script. You’re going on a Holiday to an exotic Africa. However your plane experiences a breakdown and needs to land in the middle of wilderness. Searching for rescure you find out nearby a small oasis with a primitive wooden hut. With a hope you quickly run inside but as you only entered the hut, the door locks down with a rumble. You got trapped in a hideout of an old hermit who does not like unwelcomed guests. Fortunately the host is not at home but the notes you manage to read says that the hut is cursed. Everyone who remains inside after 60 minutes will be chained to that place forever.. Nothing here is obvious. The old hermit had no contact with civilization for a long time. You will find objects forgotten by a civilized world and discover the treasures collected for years. 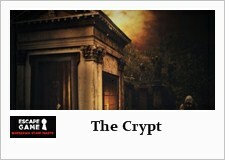 Take the challenge, read the encrypted signs and face up amazing riddles. 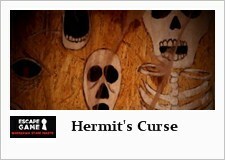 Try to get out before the time runs out and you will be forced to share the fate of an old hermit. Long long time ago there was a bad magician living in a big castle. He knew all the good and bad spells. One day the fire destroyed the castle. After many years you’re the group of treasure hunters visiting ruins of an old castle. Unexpectedly you see dark, rusty door. When you open them, some ancient force is pulling you inside. Walking up in chains you realise that to escape you must follow the old magician path. Use ancient spells and cooperate. You’ve got 60 minutes before the Crypt’s door closes forever..